There are so many different tattoo designs available that it can be difficult to choose. 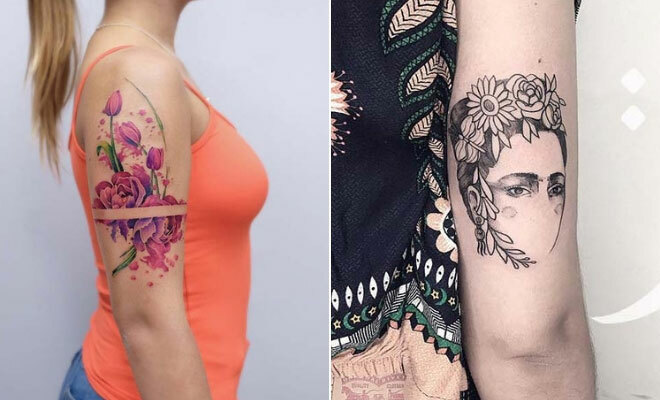 You may have spent hours scrolling through Instagram and Pinterest looking for the perfect piece of body art. Well, search no more because we have put together a list of the 23 coolest tattoos for women. There are animal tattoos, floral designs, skulls and more. We have a tattoo for everyone so take a look to get inspired! You won’t be able to decide which tattoo to have, who knows you might even choose two. First up we have this trendy floral tattoo. The design features beautiful pink peonies and tulips. There is also a stripe of skin running through the middle that is not tattooed. We love this design feature because it creates a unique, stylish and artistic tattoo. Recreate this or you can choose any flowers. Next, we have a very unusual and beautiful tattoo to show you. This is a sternum tattoo that features a triangle outline with an elephant in the center. The elephant has a butterfly wing design on the ears which transforms this simple design into a unique one. It is a gorgeous tattoo and combines a trendy geometric design with animals. You can try a similar tattoo to this or you can change the shape and try a different butterfly design on the ears. Rib tattoos have become super popular and with designs like this one we can see why. Here we have a stunning floral rib tattoo. The colors used are just stunning and this is a cool piece of body art that will suit everyone. This would be a great idea for the ladies who need a tattoo that can be covered up too. Recreate this or try different flowers. Our next idea is trendy and edgy. 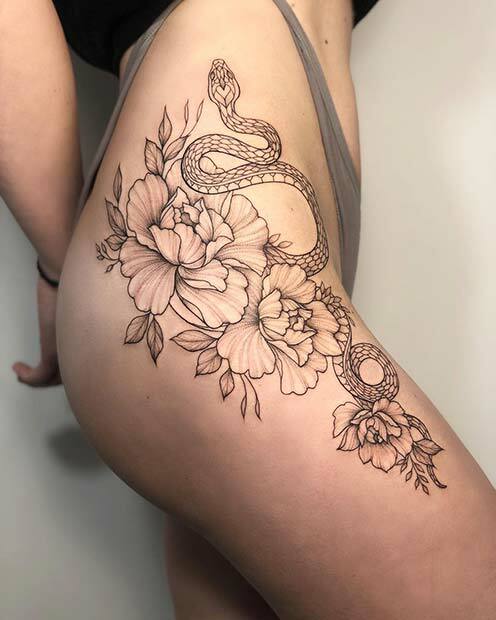 Here we have a thigh tattoo that features a peony and snake design. The snake looks super cool and it is a symbol or rebirth, transformation and more. 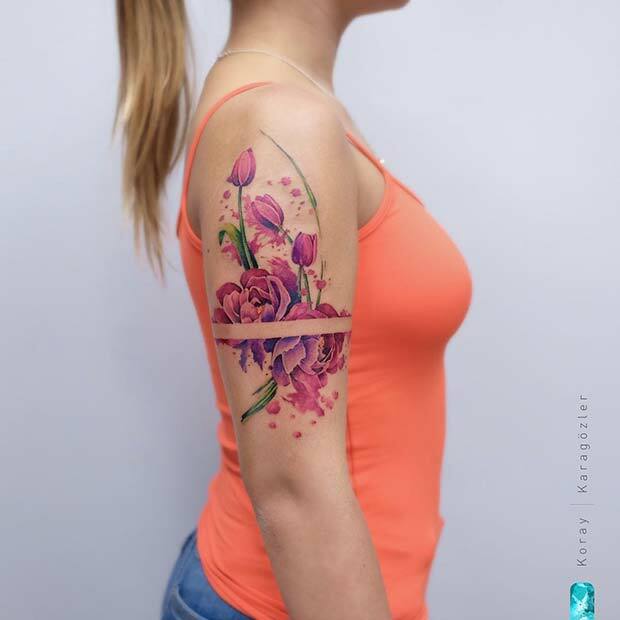 You can recreate this stunning tattoo or have a snake tattoo without the flowers. You can also add color too, as snakes have some amazing, bold patterns. The next tattoo is cool and magical! 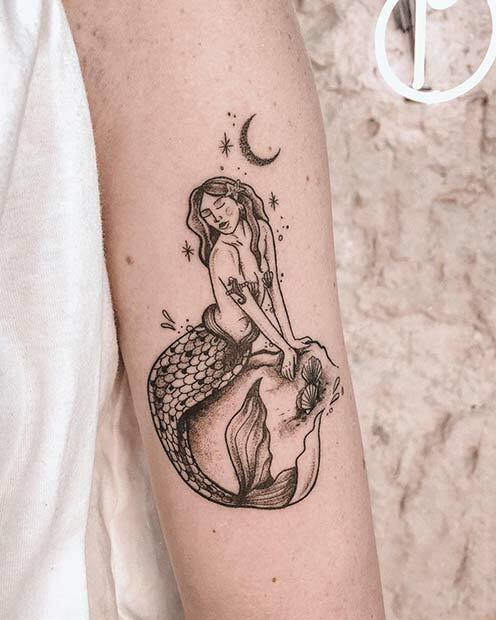 This tattoo features a beautiful mermaid. The mermaid is sat on a rock under the moon. This is perfect for anyone who loves mystical mermaids. Try a black ink design like this or you can add color. You can have a design like this placed anywhere on the body too. Back tattoos are cool and trendy. Don’t just take our word for it, check out this floral back tattoo. 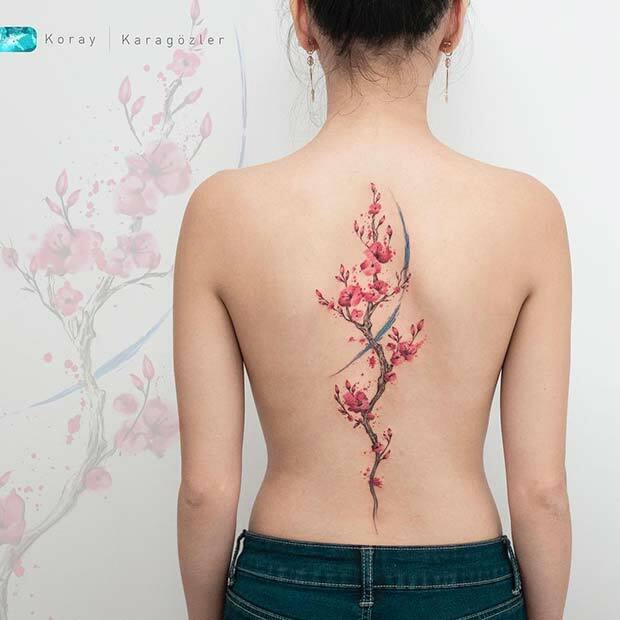 The design features beautiful cherry blossoms that are tattooed along the spine. You can recreate the cherry blossoms or choose any flowers for a design like this. You could even choose your birth flower or your favorite flower that has meaning to you. Looking for a unique tattoo? Then this is for you. 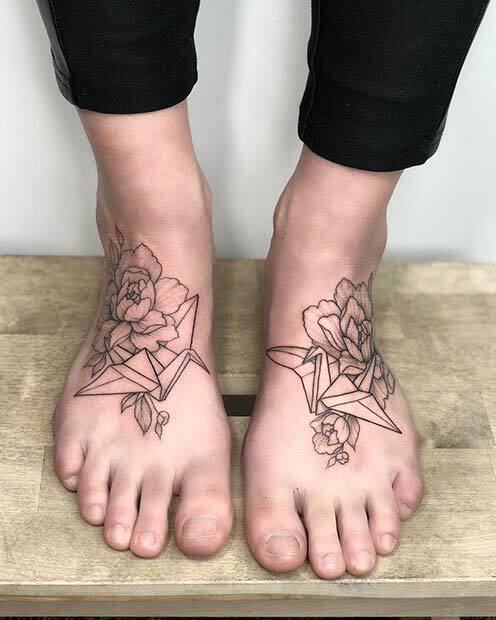 Here we have two matching foot tattoos that feature peonies and origami cranes. It is a quirky tattoo and the crane can symbolize protection, prosperity and peace, so it has a positive meaning too. Try the matching tattoos or you can have a similar design on just one foot. 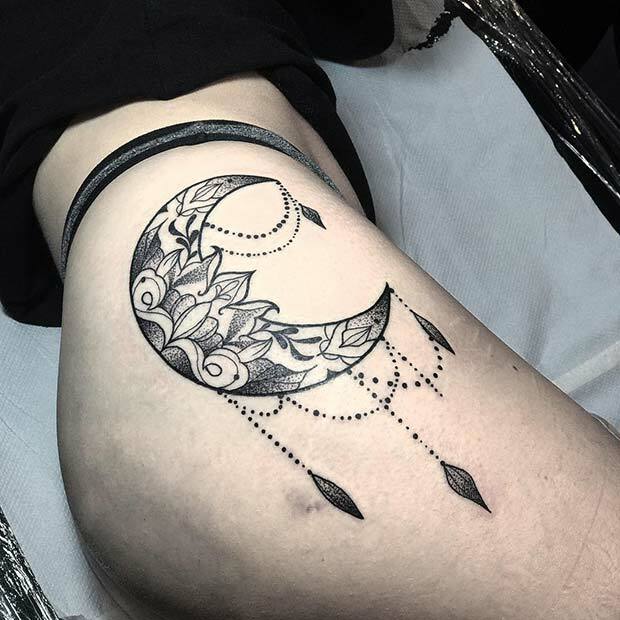 Moon designs have also become very popular in tattooing. Next, we have a beautiful example of a moon tattoo to show you. This is a thigh design that features a large crescent moon that is decorated with gorgeous patterns. There are also jewelry charms dangling from the moon too. This is such a pretty and stylish design. You can have a tattoo like this or create your own patterned moon. Show the world how strong, fierce and loyal you are with a lion tattoo like this! 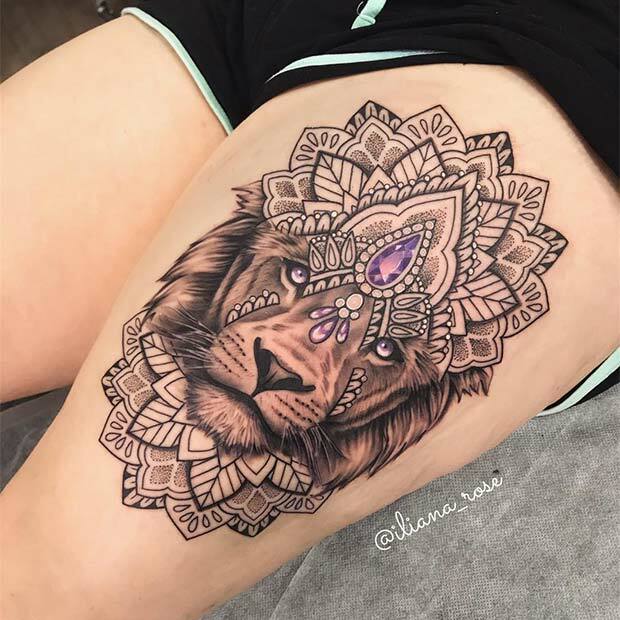 The tattoo features a stunning lion that is surrounded by beautiful patterns. It is tattooed on the thigh but you can have a lion tattoo placed anywhere. Try patterns like these, change the design or have the lion without the patterns. Either way, it will look amazing. The next tattoo we have to show you is so unique and cool! 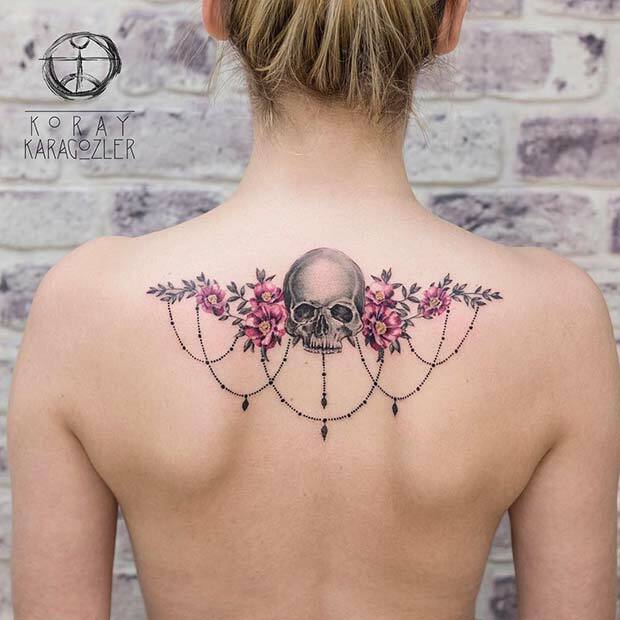 This is a back tattoo that features a skull in the center with flowers on either side. The design also has beautiful jewelry charms too. We love this tattoo idea because it is edgy. You can have a skull tattoo like this with any flowers.